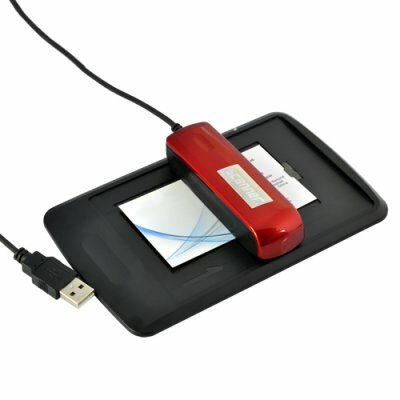 Successfully Added USB Mini Portable Picture and Document Scanner to your Shopping Cart. Instantly and conveniently digitize all those photographs, business cards, and receipts with this USB Mini Portable Picture and Document Scanner. All it takes is a USB connection to your computer to power this USB Mini Portable Picture and Document Scanner. Then, just sweep the scanner over an area and its sensitive color image sensor saves the 300 DPI images directly to your clipboard, letting you paste images directly onto a document or chat window (like MSN, QQ, etc). Photos, business cards, newspapers articles, receipts, notes - this USB Mini Portable Picture and Document Scanner is great for everything! Tired of all those heading to the local Kinko's just so you can make a scan of a single document? With this USB Mini Portable Picture and Document Scanner, it's only a matter of seconds. It's one of our most convenient, portable, and easy-to-use designs ever; Even grandma can use one this Christmas to scan all those recipes she chances across from time to time. Available in our warehouse now, order today and we'll express ship it out tomorrow! Brought to you by the leader in wholesale electronics, Chinavasion. Scan pictures, receipts, business cards, recipes, etc.